Nissan has developed a new in-car interface that uses augmented reality to track what's happening around you and predict what's coming up on the road ahead. Invisible-to-Visible (I2V) combines local data from the car's sensors with global data on transport infrastructure to track your immediate surroundings and predict what's ahead – even letting you 'see' through buildings and around corners. To make the information more accessible, it can be presented by a virtual 'navigator' – an avatar that appears inside the car and interacts with you in a human-like way using speech synthesis. This could be a cartoon character, a virtual representation of a friend or family member, or someone else. Nissan says that I2V will bring together the real world and what it calls the metaverse. "Simply put, the metaverse is a virtual universe," says Tetsuro Ueda, an expert leader at the Nissan Research Center. "Sensor data, cloud data and artificial intelligence live in the digital world, and their communication language is binary. However, humans cannot understand what's being communicated just by looking at the binary data. "Invisible-to-Visible technology is the interface that merges the data world and the real world - a new level of connectivity that connects cars to the metaverse." I2V will work for both manual and autonomous driving. For autonomous cars, Nissan hopes that the technology will make being chauffeured around a more pleasant experience – showing you the outside world on a sunny day when it's actually raining, for example. It's also hoped that showing a visualization of what the car's artificial intelligence 'sees' will put passengers at ease, and help them trust the vehicle. 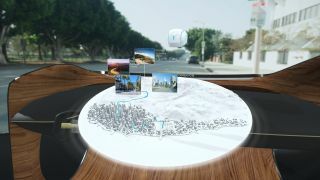 For manual driving, the interface will appear as an augmented reality overlay on top of the real view through the car's windshield. It will also show you information about your estimated travel time, upcoming road congestion, irregular road surfaces, and other factors that could surprise you. I2V will also let you know if someone is about to cross the road ahead, or a parking space is about to become available. You can even choose to book guidance from a professional driver, who will give you personal instructions in real time to improve your driving. The driver will appear as a virtual car in your field of view, which you can follow. Nissan will be showing off the tech at CES 2019, where visitors will have the chance to try the interactive, 3D interface for themselves.